And here is the continuation of the previous dashi post! 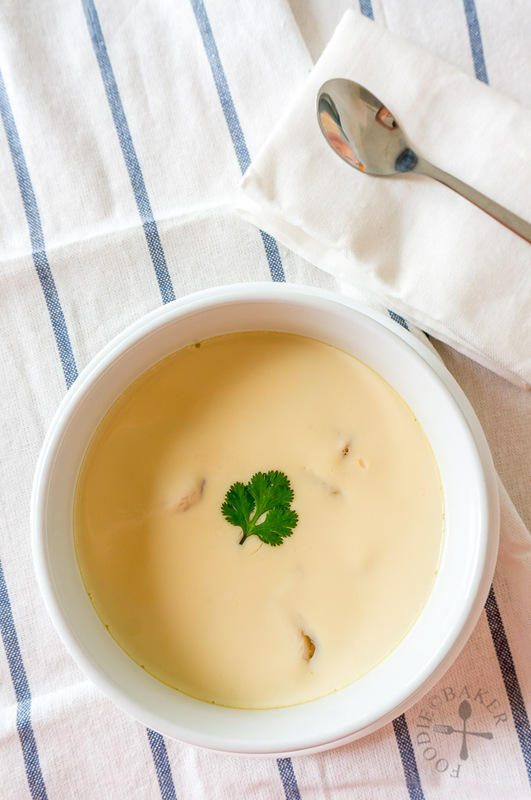 Chawanmushi is a popular Japanese side dish that I made immediately after I made the dashi because it is one of my top favourite Japanese dishes ever. I love how the egg custard is so silky soft, tender and quivers under the slightest pressure. It is also extremely flavourful and rich with umami-ness – which is attributed to the use of dashi. Next, the egg:dashi ratio will determine how silky your chawanmushi will be. Too much dashi, and your eggs will never set. Too little dashi, your chawanmushi will not be as silky. From my research, the amount of dashi used for every egg ranges from 1/2 cup to 3/4 cup. I in the end settled for 2/3 cup of dashi and found the silkiness just the way I like it. Do note that the eggs I used are large eggs, which weighs about 55 grams each (without shell). 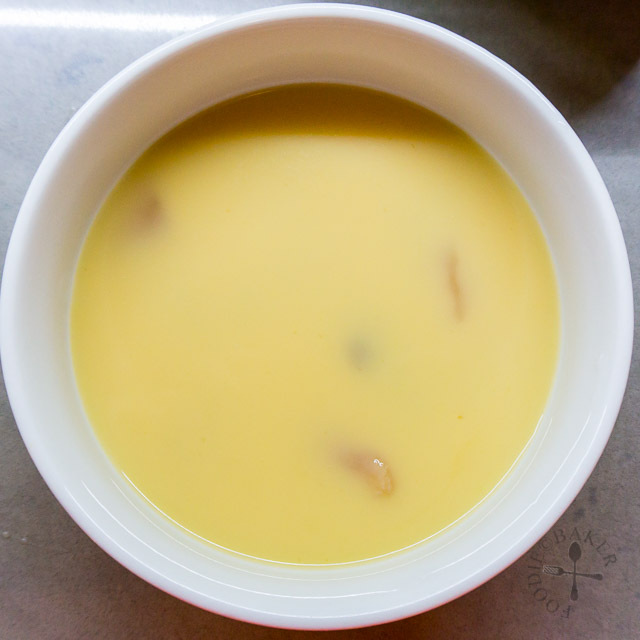 Lastly, low heat should be used when steaming the chawanmushi so as to create the flawless and smooth top. I had steamed egg mixture (Chinese-style) over high heat before and oh my, when I dug into the steamed egg, it looked like a honeycomb and did not taste very good (perhaps also because I over-steamed the eggs). I guess it’s due to the air bubbles in the mixture which expanded and escaped vigorously during the steaming process, leaving behind huge, ugly holes in the steamed eggs. And I think that’s it! 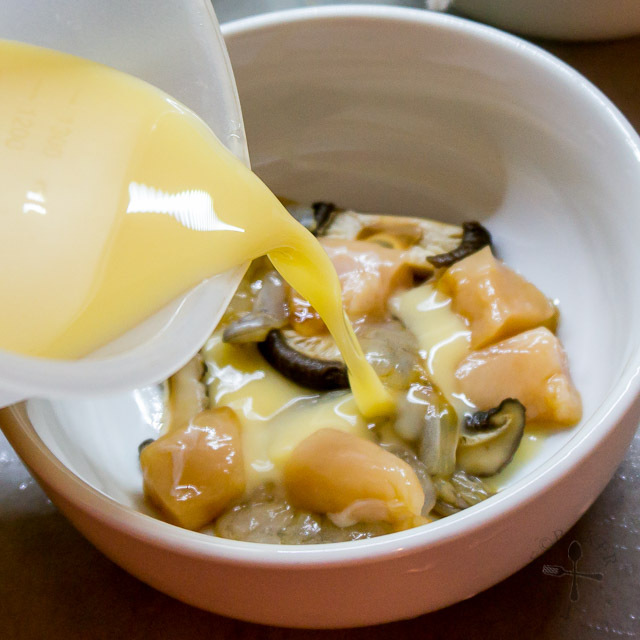 You can play around with the fillings for the chawanmushi – adding ginko nuts, carrot slices or perhaps arrange them on top nicely instead of burying them underneath like me (I am just lazy prefer to admire the silkiness of the egg custard heh). 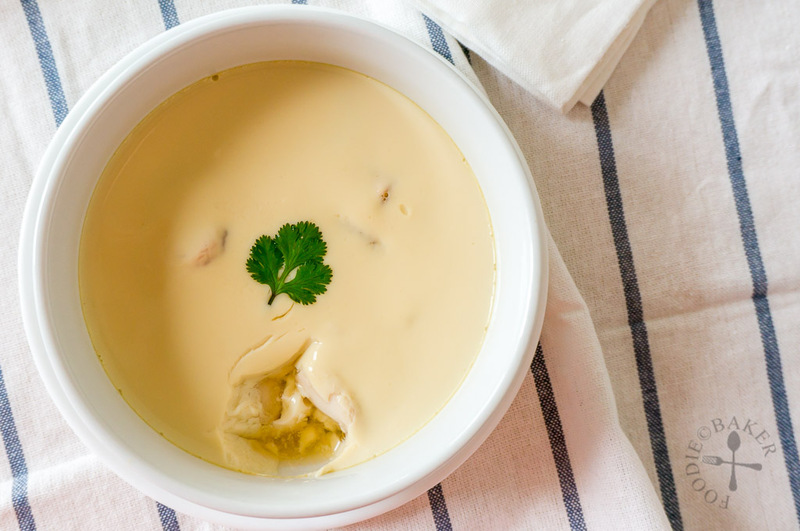 Good luck in making your own perfectly silky chawanmushi! 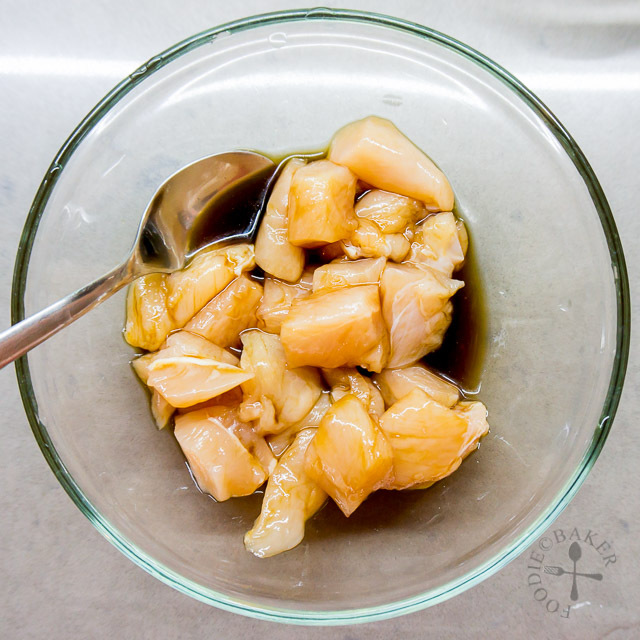 1) Marinate chicken with soy sauce and sake. 2) Do the same for prawns. 3) Crack eggs in a large bowl and beat gently with a pair of chopsticks. 4) Whisk in dashi, followed by salt, soy sauce, sake and mirin, taking care not to incorporate too much air bubbles. 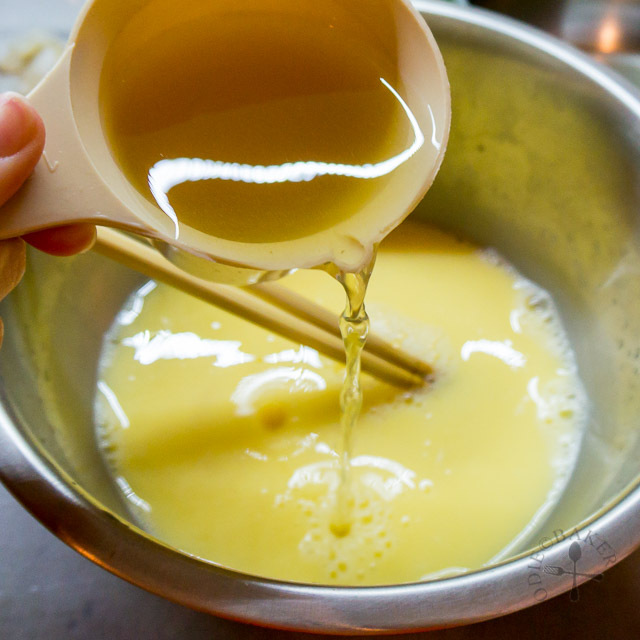 5) Strain the egg mixture into a measuring cup over a fine sieve to remove air bubbles and any eggy lumps. Discard the eggy lumps. 6) Divide the shiitake mushrooms, prawns and chicken among 4 (or 2 if desired) bowls / teacups / ramekins. 7) Pour in the egg mixture. If there are air bubbles on top, blow at the air bubbles to remove them. 8) Cover the bowls / teacups / ramekins with aluminum foil and steam for 10 to 15 minutes until done. 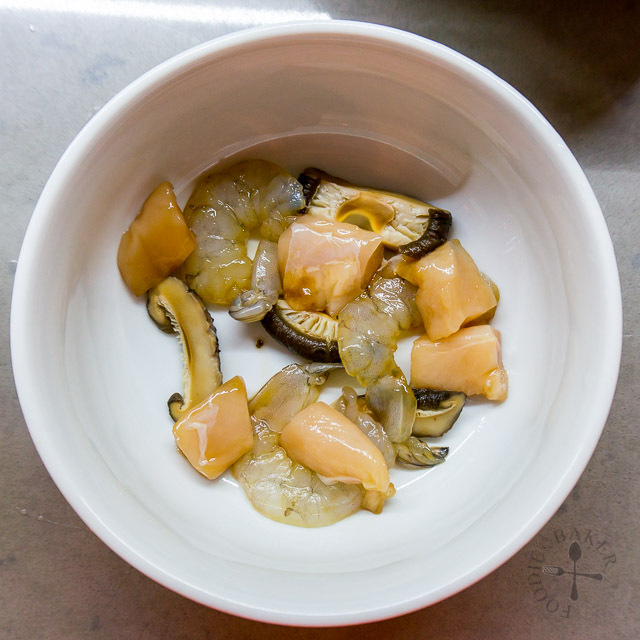 Rehydrate the shiitake mushrooms by soaking them in hot water (or cook them in Niban Dashi). Remove the stems and slice the mushrooms. Set aside. Place the prawns and chicken in separate bowls. Marinate them with 1 teaspoon soy sauce and 1 teaspoon sake each. Set aside. Crack eggs in a large bowl and beat gently with a pair of chopsticks. Whisk in dashi, followed by salt, soy sauce, sake and mirin, taking care not to incorporate too much air bubbles. 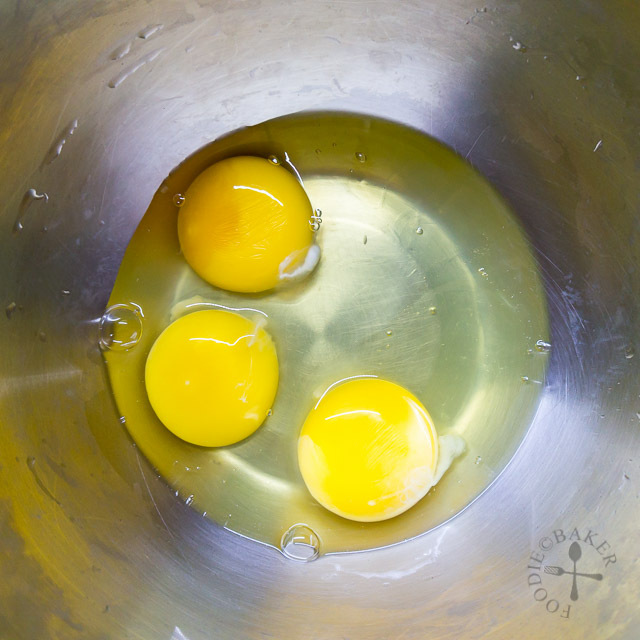 Strain the egg mixture into a measuring cup over a fine sieve to remove air bubbles and any eggy lumps. Discard the eggy lumps. Set aside while you prepare the steamer. Prepare your steamer - for me, I heat up about 1-inch of water in a pot and set a wire rack inside. Divide the shiitake mushrooms, prawns and chicken among 4 (or 2 if desired) bowls / teacups / ramekins. Pour in the egg mixture. If there are air bubbles on top, blow at the air bubbles to remove them. Cover the bowls / teacups / ramekins with aluminum foil and place them in the steamer. Turn the heat down to low immediately and steam on low heat for 10 to 15 minutes if making 4 portions, 15 to 20 minutes if making 2 portions. 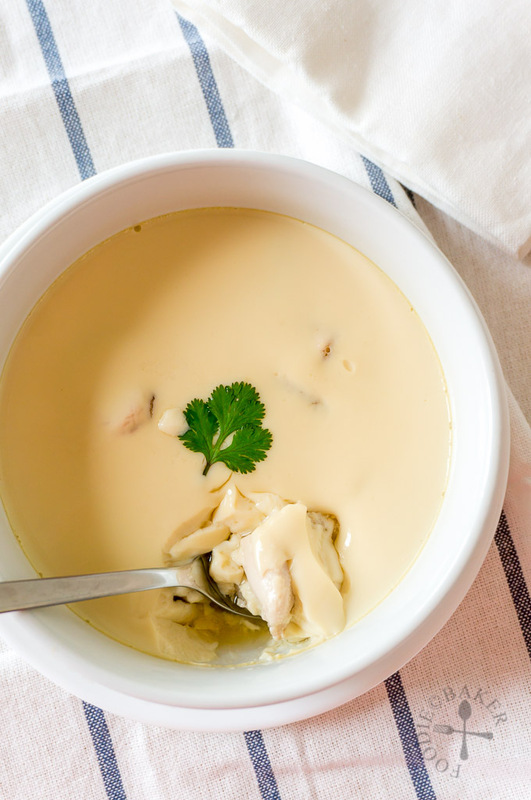 Remove the aluminum foil and check for doneness - the top should bounce back when the back of a spoon is pressed very gently on top and clear stock should run after a chopstick is inserted into the centre of the chawanmushi. Place the coriander leaves in the centre of the chawanmushi (where you pierced with your chopstick) and serve immediately. - The ratio of egg to stock is important to get a perfectly silky chawanmushi. The eggs I used weigh about 55 grams each (without shell). If your eggs are small, use one additional egg (and vice-versa). 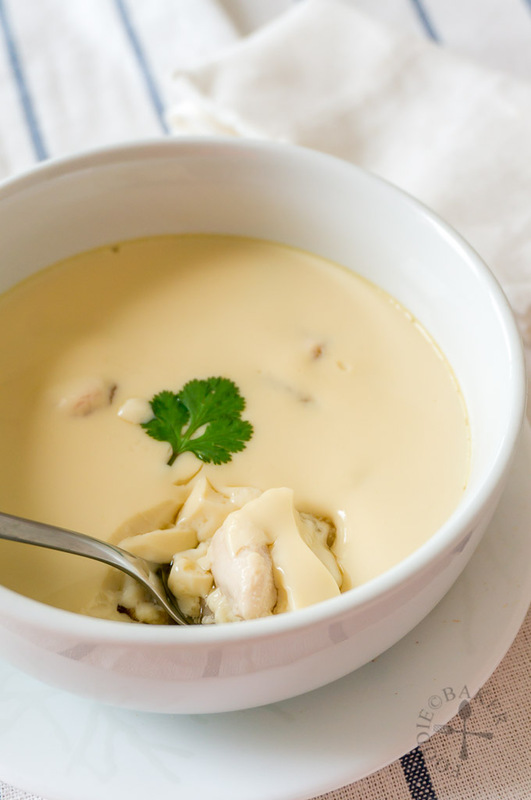 - If you don't have dashi, you can use unsalted vegetable stock or unsalted chicken stock. If you can't get unsalted stock, try to at least use low-sodium stock and reduce the amount of light soy sauce to taste. Do also note that the resulting chawanmushi will taste different. 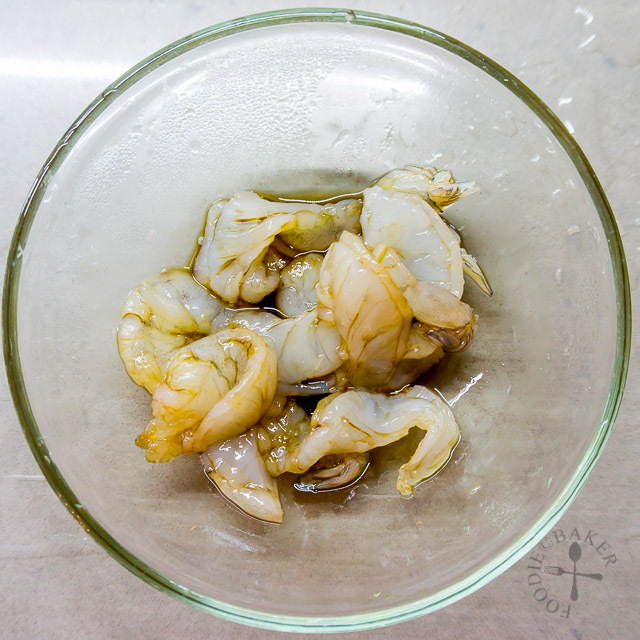 - For the filling, I don't bother par-boiling the chicken / prawns as I cut them into small pieces and they are cooked together with the egg custard. You can also use whatever you want, as long as they are cut into small pieces so that they cook within 15 minutes. - For a luxurious garnish, use uni (sea urchin) or ikura (salmon roe). - Adapted from Japanese Cooking 101. That is a beautiful bowl of silky chawan mushi. How long can it keep in the fridge, in case I make a few bowls of it for the week? Hi Barby, sorry it’s not possible to make chawanmushi in advance. 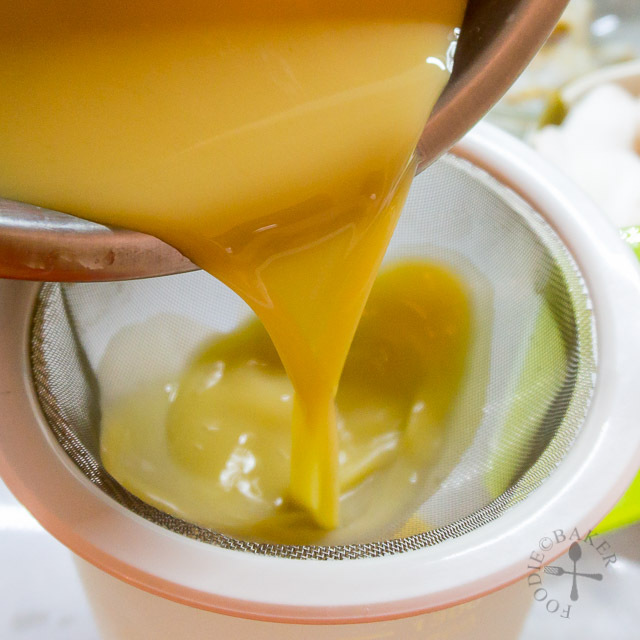 The dashi, however, can be made in advance and stored in the refrigerator for 3 to 5 days. Where can i buy ichiban dashi? Alternatively, you can get dashi powder to make the dashi. I love savory egg dishes and this is a new one for me. It looks so creamy and smooth and all the flavors must taste wonderful together, Jasline! Yum. I love chawanmushi so much. I can eat bowls and bowls of it. I’m the same as you AiPing, one is never enough! Jasline, I have not had chawanmushi for ages…and your look incredible…silky and creamy…perfect texture. Thanks Juliana! This is the first chawanmushi I had this year, but definitely not my last 😉 Have a great week ahead! That’s indeed very soft and tender! Oh my gosh…. this looks ridiculously smooth and silky! Sheer perfection! I wish I had bowl right now! Thank you! Wish I can make one for you right now! Oh my how I wish I’m in Japan right now! I’ll be feasting all the time! XD thanks for dropping by Lorraine! Your chawanmushi looks perfect! Wish I could dig into that bowl! Looks very smooth and silky! Thank you Joyce! I’m sure you can make an even better one than me! thanks for sharing this silky smooth chawanmushi ! The chawanmushi is perfect! It looks so smooth and silky. It’s very tempting! I’ve wanted to make a savory custard for a long time and was just watching a Korean cooking show last night making a prawn one. This looks amazing – perfectly silky. And I love the chicken and prawn filling you used in yours. It’s so very tempting! Thanks Monica! I love eating savoury egg custard as it goes so well as a side dish. Can’t wait to see your take on this one!